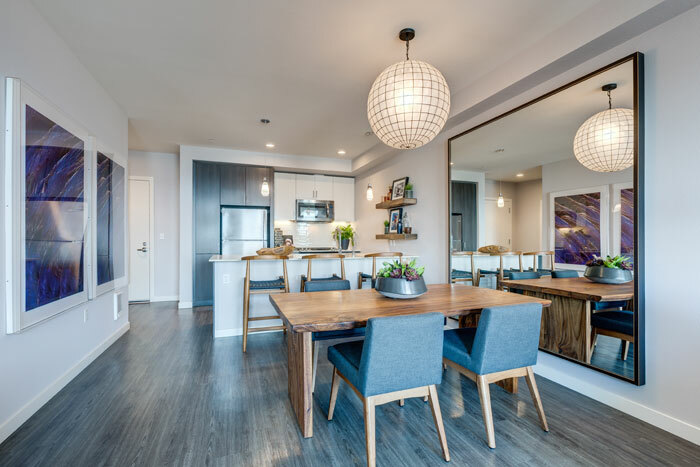 Photos courtesy of Greystar: There are 168 apartment units in the recently opened Elan Uptown Flats development, which are spread across two buildings, and include studio units up to three-bedroom options in Uptown. 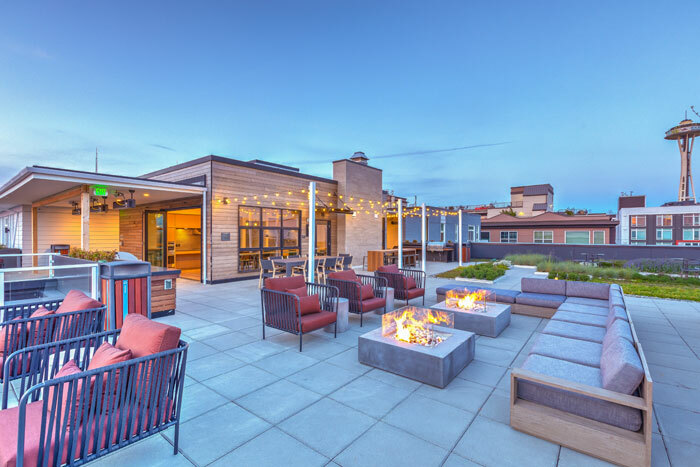 A rooftop club room is available for residents wanting to host gatherings. The rooftop also has plenty of outside space, which includes an additional entertainment area and dog run. One of developer Greystar’s latest Elan communities is now leasing in Uptown. Construction of Elan Uptown Flats, 300 First Ave. W. started in 2015, two years after the site was acquired. The apartment development consists of 168 residential units and 14 live/work units spread across two eight-story buildings. The west building opened in April, followed by the east in October. Elan Uptown Flats is 74 percent leased, offering a number of apartment options: studio, one-bedroom open, urban one-bedroom, live/work, lofts, two-bedroom and three-bedroom. Higher levels and corner units are leased at a premium, with 9-15 month options priced at a flat rate. The Elan brand is meant to represent energy, style and enthusiasm, according to Greystar, and then incorporates the neighborhood into its name. Elan Uptown Flats also includes Pacific Northwest elements in its design, using cedar for the majority of the exterior siding. 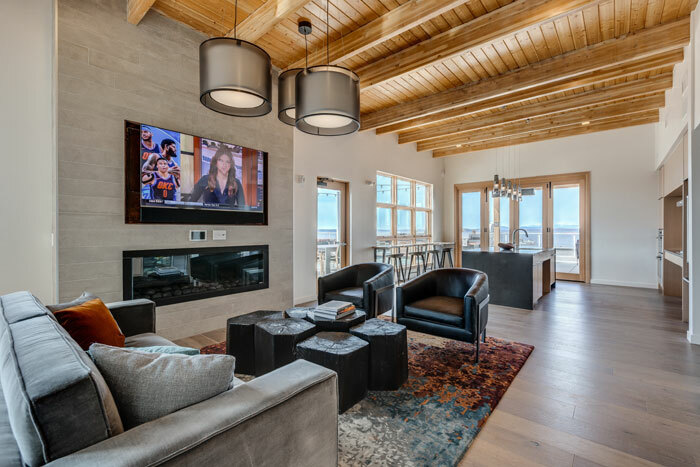 Two custom colors, “Biscuit” and “Umber,” are used on the wood soffits featured heavily in the interior. The floors in all units are vinyl plank, except for in the bedrooms, which are carpet. Local architecture firm Weber Thompson was the architect and interior designer for the project, which is certified LEED silver. Solar panels are located on the west rooftop, which also boasts an off-leash dog run, green space, barbecues, a community room with kitchen and outside entertainment center. There are three electric charging stations in the garage, with 142 total stalls and currently 70 percent occupancy. Amenities include a 24-hour fitness center, dog wash, gas ranges, club room and 24-hour package concierge; lockers near the mailroom can be accessed with a code sent to residents by text or email. Greystar has both a high-rise and mid-rise community that recently opened in South Lake Union, Ascent and Marlowe, and recently received design review approval to start two more developments, the Arista Residences across from University Village and Waverly in SLU. More information about Elan Uptown Flats, including floor plans and leasing options, is at elanuptownflats.com.